For more detailed information, please see our EDIUS.NET NAB Show Report. In May we will also release an EDIUS Podcast about the news in EDIUS 9.40. Tokyo, 14th November 2018 - Grass Valley is making its new version 9.31 of the editing solution available to all EDIUS 9 users for free as usual. It is an update with minor improvements. Nevertheless, this version also contains new features. Details about these new features are shown in our EDIUS podcast "New in EDIUS 9.31". Both the Pro and Workgroup versions now contain an extended “Edit marker” dialogue box. In this the color of the marker is now freely selectable. For the division into chapters for Blu-ray, DVD, Flash Video and Stratus the standard orange marks are available. The out-point and duration can be set. Sequence markers now have an anchor option. For an even faster access to the dialogue box, it is now also possible to set a keyboard shortcut or a button. Details about this function can be found in our EDIUS podcast "New in EDIUS 9.31". EDIUS now also supports the HEVC/H.265 footage of the Fujifilm X-T3. Thus, all formats of the new mirrorless system camera can now be processed directly. EDIUS now also supports the new Nikon color space N-Log. This means that virtually all currently known log formats such as Arri Log-C, Canon C-Log, DJI D-Log, Fujifilm F-Log, JVC J-Log, Panasonic V-Log and Sony S-Log can be processed directly. This support also allows for a simple color space conversion via the primary color correction. This feature is interesting for users who e.g. work with UHD in 50p, but only use a UHD 25p editing card or just an HD monitor. Until now there was simply no output possibility if the preview device did not support the project format. Now the conversion allows a preview of higher resolutions and frame rates. An algorithm checks which conversion format is the most reasonable and compatible with the hardware. Both in the Pro and in the Workgroup version 9.31 the preview mode is displayed in the status bar. Depending on the conversion mode, a corresponding symbol is displayed. Details about this function can be found in our EDIUS podcast "New in EDIUS 9.31". The Workgroup version offers a special HDR Monitor Control function. This function takes over the color space control for compatible monitors. Currently some EIZO monitors are already supported, from version 9.31 now also the model "EIZO ColorEdge CG279X". 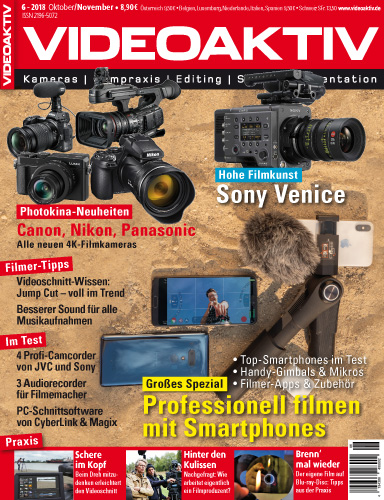 We very much appreciate that this article of Germany’s leading video magazine “videoaktiv” once more underlines that EDIUS does make a lot of a difference with its claim and true performance when it comes to “Edit Anything!”. Amsterdam, 14th of September 2018 - At IBC, Grass Valley introduces the latest version 9.30 of its EDIUS editing solution. This update focuses on the implementation of various feature requests from filmmakers, TV stations and production companies. EDIUS 9 users can download the update to version 9.30 from 17th September 2018 for free as part of the regular feature expansion by Grass Valley. New features include the closed caption display, which allows subtitles to be switched on and off as needed. The subtitles are not burned into the image but are part of the metadata in the video stream. This provides the flexibility desired by users. Recording in 50/60p – also in UHD – is becoming increasingly popular and EDIUS has always supported these frame rates. As of version 9.30, EDIUS now also introduces the 50/60p timecode display. The frames are numbered from 0 to 49 or 59 respectively. EDIUS provides intuitive and fast color correction tools, making it ideal for editing scenic work, which is often recorded in raw format. In addition to Sony Raw and Canon Raw, EDIUS 9.30 now also provides full GPU acceleration for RED Raw. As the first editing software ever, EDIUS 8.30 was able to calculate convincing slow motion and frame rate conversions in real time. EDIUS 9.30 now also offers the opportunity to individually adapt various parameters in order to optimize the image analysis and interpolation of the respective image material. The result is a quality increase in slow motion and frame rate conversion. In addition to new added formats, the exporter now offers up to four standard settings instead of one. The user can thus export even faster in the typical formats used and also create keyboard shortcuts and buttons for these. This applies both to the individual file output and to the batch export, in which several files are exported at once. Starting with IBC there is a special campaign in Europe, Middle East and Africa (EMEA) running until 31st May 2019 (time frame extended). Anyone purchasing EDIUS 9 from 14th September 2018 will receive the high-quality video effects program ProDAD Vitascene V3 LE worth 167€ as a free bonus. Existing EDIUS 9 customers have the possibility to buy Vitascene V3 LE for just 39€. Users switching from another editing software can now buy EDIUS Pro 9 "Jump 2" for only 369€. This promotion is also only valid in EMEA. The website www.edius.net informs about the requirements for the crossgrade offer, the new features in version EDIUS 9.30 as well as the media management tool Mync, which is contained in EDIUS. On this website users find the EDIUS 9.30 update download (www.edius.net/updates), the free 30-day trial as well as the latest EDIUS podcast (www.edius.net/podcast), which presents all the innovations of EDIUS 9.30 in detail. This small update to version 9.21.3770 includes bug fixes and an updated support for Grass Valley Stratus. The update to EDIUS 9.21 is free for EDIUS Pro 9 and Workgroup 9 customers. Details regarding the updates can be found in the EDIUS 9.21 release notes. Note: New functions are planed for the upcoming EDIUS version 9.30. (Release date: Mid September 2018 at IBC).